In order to collect as many petition signatures as possible and to boost the visibility of the NGO, World Cup 2018 themed video adverts were displayed. Both branding and performance objectives were successfully reached. Amnesty International is a Non Governmental Organization which defends Human Rights across the globe. Worldwide, it has more than 7 million supporters and 2 million members. 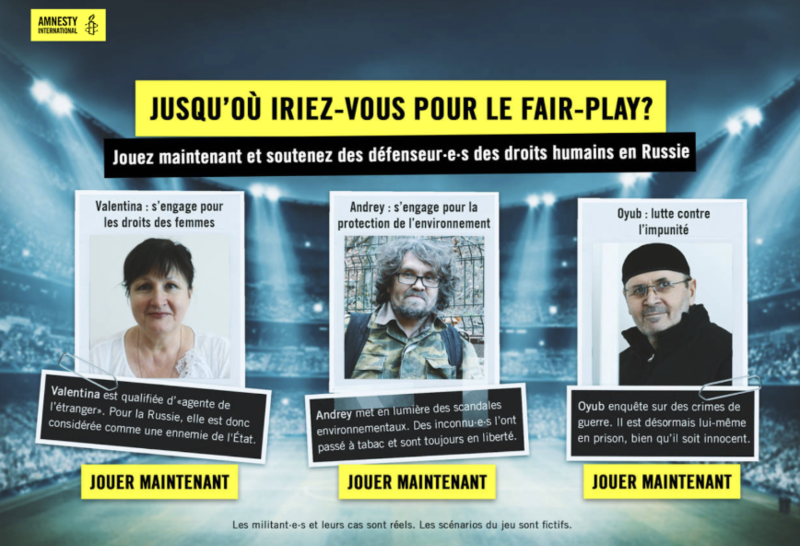 While the football World Cup was taking place in Russia in June 2018, Amnesty International Switzerland publicly denounced the injustices and Human Rights violations in Russia using a dedicated online game. In this game, the player takes the role of one of three Human Rights defenders in Russia. Valentina, Andrey and Oyub are actual militants and their stories are real. The player is confronted with several fictitious scenarios based on facts of real daily life in Russia. The game’s goal is to raise the players’ awareness about Human Rights problems in Russia while having fun playing it. A video was produced to promote the game and to collect signatures for petitions. It takes place within the context of the 2018 World Cup in Russia, an event which metaphorically spans the globe bringing together all football lovers, whether fanatical aficionados or mild enthusiasts. Amnesty International entrusted the production of these videos to Suisseo, a creative online marketing agency. How are players engaged and encouraged to reach the end of the game? 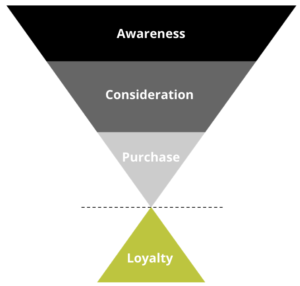 The conversion action attribution model is position-based, to achieve better understanding of campaign performance and to optimise campaigns based on the user’s conversion path. Broadcasting videos to a qualified and relevant target audience was one of our main objectives. To respond to the dual challenge of branding and performance, the strategy was to reach out to users on every stage of the acquisition funnel. The TrueView for Action campaigns, direct response solutions on YouTube, have allowed us to add visible call to action as well as overlapping titles to our video adverts. It is possible that this format have encouraged leads to then generate more conversions and perform other relevant actions. The personalised Call to Action, as below in the ‘Jouer’ [play] example, encourages the user to click, above all when associated with sound and a strong, emotive image. This resulted in a click-through rate that was 20 times higher than with other YouTube formats. The tracking/audience/attribution/format mix was a true success because the objectives were achieved. With a moderate, yet intelligently allocated budget, the advertising video was able to generate more than 1.5 million hits. The viewing rate of 4% shows a definite interest from the audience. The YouTube channel AmnestySchweiz also acquired numerous new subscriptions. More signature for the petition were collected via the Trueview for Action video than by the Search campaigns. 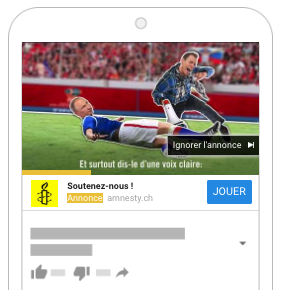 A first for Amnesty International, which until now, had never registred direct conversions from video campaigns! Currently, the NGO is considering reallocating a part of its media investment to YouTube with the Trueview for Action device, which will allow for profitable conversion and branding.